The mascil toolkit has been designed to support professional learning in the wide range of settings that are present in different European countries. For example, it may be used as a basis for a professional development course led by a trainer or it can support a group that is self-directing in its approach. Alternatively it can be used by groups working in a way that falls somewhere between these contrasting models. 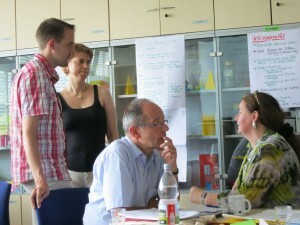 However, in each different setting there will be one person who takes a coordinating role and facilitates the sessions. The toolkit is addressed to that person but incorporates a full set of professional development tools for use with the teacher group. That an intervention needs to be sustained over substantial periods of time. That one successful approach involves collaborative communities of practice of teachers working to enquire into their professional practice. That such communities are often kick-started and sustained by outside expertise, provided by maybe a ‘trainer’ or a university educator. That the most successful professional development pays attention to the development of the subject (mathematics or science), itself and particularly student learning. With mascil, therefore, in whatever way your group works, it is expected that teachers will meet together to discuss issues appropriate to their teaching and then explore ideas in their classrooms before they meet again to discuss outcomes and progress. These cycles of inquiry underpin the activity of all Mascil teacher groups. Within each domain (Ways of working, Inquiry and IBL pedagogies, World of work), we have identified the key issues and then, for each issue, the professional questions that teacher groups may wish to explore. Some suggested routes through the toolkit are provided in Tool PDA-1: Routes through the toolkit it is also important to think about the way the teacher group will work together. Tool PDA-2: Coordinating a professional learning community will help you, as a coordinator, think about your role in facilitating the discussions and developing the group into an effective professional learning community before using the tools in the following sections How can the mascil resources be used? and How will we work as a teacher group? to discuss priorities and ways of working with the actual group.